It’s the kind of grand Old Hollywood story that, if not true, should be. Filmmaker Howard Hawks claimed on several occasions, to a variety of sympathetic interviewers, that he was entertaining dinner guests in his home during the late 1930s when someone steered the conversation toward the fine art of movie dialogue. Hawks flatly announced that the best dialogue he’d ever heard came from Ben Hecht and Charles MacArthur, and that the very best Hecht-MacArthur dialogue came from The Front Page, their exuberantly cynical 1928 stage play about roguish reporters covering an execution in a colorfully corrupt Chicago. To prove his point, Hawks produced two copies of the original Front Page script. (Pretty convenient, his just happening to have those scripts on hand, but never mind.) He gave one copy to a young lady in attendance, and asked her to read the part of Hildy Johnson, the veteran reporter who vows to quit the wordsmith racket so he can marry into wealth and respectability. Hawks himself read the part of Walter Burns, the robustly unscrupulous editor who will use any means, fair or foul, to keep Johnson on the staff of his newspaper. “And in the middle of it,” Hawks recalled, “I said, ‘My Lord, it’s better with a girl reading it than the way it was!’” Which led, according to Hawks, to his remaking The Front Page – previously filmed in 1931 by Lewis Milestone, with Adolph Menjou and Pat O’Brien in the leads -- as His Girl Friday. Fact or fiction? As author Todd McCarthy notes in his admiring biography, Howard Hawks: The Grey Fox of Hollywood, it’s mighty strange that no dinner guest, including the unidentified woman who read Hildy, ever mentioned being present during this fateful evening in Hawks’ home. And it’s even stranger to imagine Hawks, aptly described by McCarthy as “the antithesis of the fast-talking, hard-driving verbal type,” zipping through the rapid-fire repartee penned by Hecht and MacArthur. But so what? To paraphrase a line from John Ford’s The Man Who Shot Liberty Valance – spoken, appropriately enough, by a newspaper editor – when the legend becomes accepted as fact, why print anything but the legend? The story may be apocryphal, but it exemplifies an anything-goes, seat-of-the-pants creative process that we’ve come to accept, even romanticize, as typical of Hollywood’s golden age. In much the same way, His Girl Friday – arguably more than the Hecht-MacArthur original, and definitely more than any other film adaptation -- indelibly established the stereotype of reporters as rudely sarcastic iconoclasts who talk fast, crack wise and raise hell while they comfort the afflicted and afflict the comfortable. When Hawks’ Hildy Johnson (a Hildegard rather than a Hildebrand) makes her grand entrance into the press office of the Chicago Criminal Courts Building, to join the deathwatch for a luckless bumbler who accidentally shot a cop, she rubs her fashionably padded shoulders with a vibrantly motley crew of ink-stained wretches. Despite her claims to the contrary, she looks and sounds like she’s precisely where she’s meant to be, because she can talk faster and crack wiser than anyone else in the room. Rosalind Russell wasn’t Hawks’ first choice, or even his fifth, to play Hildy Johnson, but her image-defining performance as the sassy and brassy newspaperwoman is swell enough to suggest that no one could have done it better. 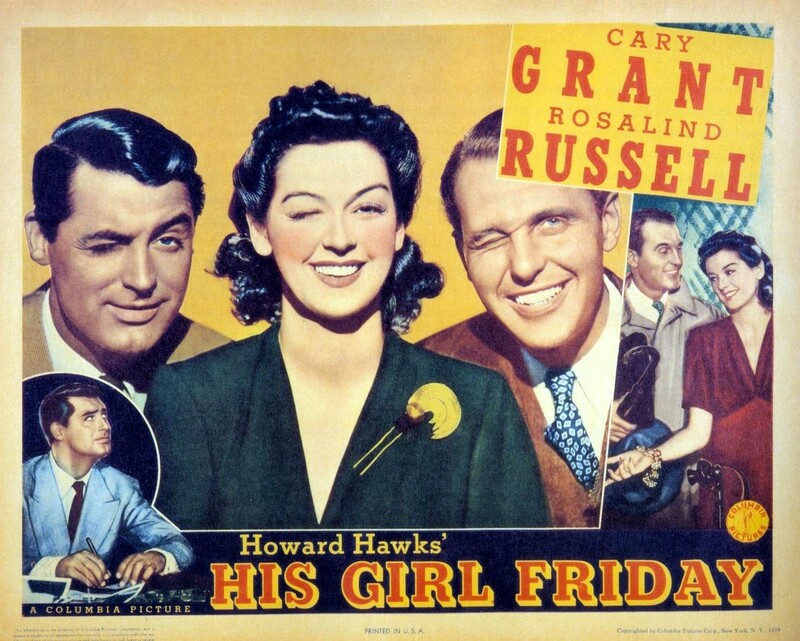 (Whenever I screen His Girl Friday for college-level film courses, female students seem particularly impressed by Russell’s portrayal of a woman liberated way before women’s liberation was cool.) Her most attractive attribute: She is a spectacularly worthy opponent in verbal jousting with Cary Grant, perfectly cast as Walter Burns, her conniving ex-editor and, more important, ex-husband. Months after divorcing Water, Hildy returns to the Morning Post newsroom, only to announce her engagement to Bruce Baldwin (Ralph Bellamy), an affably bland insurance salesman. Bruce has no connection to the madcap world that Hildy wants to leave behind, a fact Hawks subtly underscores by having Walter wait outside a newsroom gate marked “No Admittance” while Hildy bids Walter good-bye. But, of course, Hildy doesn’t fare well while trying to say farewell: Walter tricks her into doing what she really wants to do, which is remain a reporter who comes alive most fully when she’s on the prowl for a big story. And while Walter and Hildy may be, like Elyot and Amanda of Noel Coward’s Private Lives, unable to live happily either apart or together, there is no doubt that they are soul mates who speak the same language with the same warp-speed alacrity. Such rhetorical virtuosity is a defining characteristic of screwball comedy, a genre that thrived throughout the 1930s and early ’40s. Films of this sort were an escape from the harsh realities of Depression Era life, offering carefree and attractive characters behaving with abandon and freedom in a world filled with colorful but (usually) harmless eccentrics and blustering but (usually) impotent authority figures. Like many other screwball classics, Hawks’ must-see masterwork belongs to the sub-genre known as “Comedy of Re-Marriage,” being the story of divorced partners who simply must be reunited because they bring out the best in each other. Walter may be a sneak, and his motives are hardly selfless, but he genuinely admires – and values – Hildy’s professional abilities. Hildy has every reason to distrust Walter – except, of course, when he’s telling her that no one else would appreciate her, and encourage her, the way he does. Thank you for the review! Gotta find this comedy.